LED outdoor spotlight. 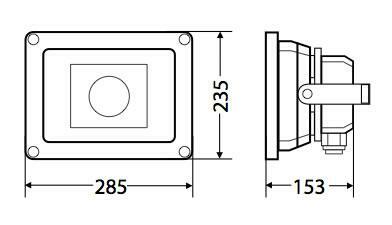 Projector High power (50W) and high resistance (IP67). High performance and maximum energy efficiency with a directional focus of 15-20 meters range of bright and shining light. Aluminum finish injection. It has a heater that ensures optimal heat dissipation. Projector slim aluminum radiator efficient injection, which guarantees optimum heat dissipation and prevents loss of light power. The radiator is equipped with a high brightness LED Microchip and works with a voltage of 85-265VAC. It has a reach of 15-20 meters. The high-brightness LED chip directs all the power under the aluminum casing, achieving exceptional performance. The waterproof casing and compact, it fits perfectly in any installation.